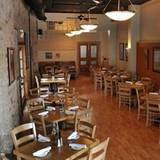 Caffé Molise has played host to wedding ceremonies, wedding receptions and rehearsal dinners. The expansive patio makes for a memorable summer event. In the cooler months our large dinning rooms can accommodate all your event and party needs. We can host your corporate meetings, holiday parties, anniversaries, and product launch parties. Now, with the recent connection to the art gallery next door, we can offer an even more expanded area to mix and mingle before your event – or to use as an intimate setting for smaller private parties. Please fill in your information below and Fred Moesinger will contact you as soon as possible to book your event. If you’d prefer to talk now, please call us at (801) 792-0691.